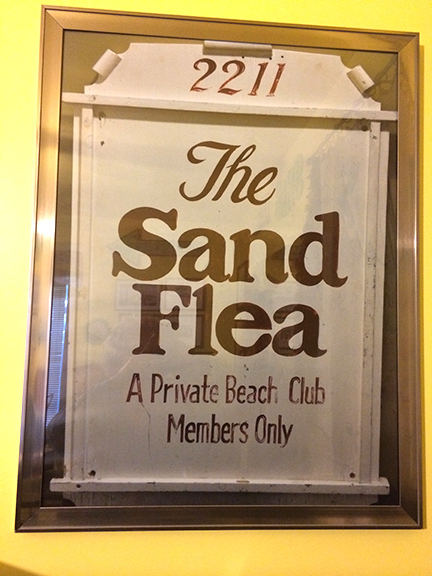 The Sand Flea Beach Club came into existence in late August of 1982. Its original site was on Rutherford Road, Greenville, SC. As with a lot of clubs, the opening of the club coincided with the closing of another, Club Savoy. Club Savoy was located in same building, and had been the club of choice for shaggers prior to the Sand Flea Beach Club. It was at the Rutherford Road location that a lot of long standing traditions had their birth. The most significant event would undoubtedly be The Beach Shaggers Hall of Fame. The Beach Shaggers Hall of Fame held its first induction ceremony in 1983 at The Sand Flea’s Rutherford Rd location. The Beach Shaggers Hall of Fame is now located in N. Myrtle Beach, SC and continues induction of new members annually. The Sand Flea operated at this site for over five years. It was during this period of time, that in the opinion of this writer that the Sand Flea family was born. Friendships were formed that not only have been life lasting, but they have endured many of life’s hardships. This family has continued to grow through the years as most families do, adding new members and loosing some members. In the spring of 1987, The Sand Flea was sold to new owners and renamed as Trader Tom’s. While the format remained basically the same, this change was surprising and troublesome for the membership of The Sand Flea. The old owners and the new owners were part of our family, and we were torn as to where to place our loyalties. During this period, members were going to different locations to meet and dance, but none of the locations were the same as The Sand Flea. It was out of this turmoil that The New Sand Flea Beach was born. A group of people interested in reestablishing what we all enjoyed on Rutherford Road met at a location on Airport Road in Greenville and agreed to invest their monies into what would become The New Sand Flea Beach Club. A property was obtained in what used to be McAlister Square on South Pleasantburg Drive in Greenville, SC. Many members of the former Sand Flea spent many nights and weekends volunteering their time and efforts in remodeling the location as quickly as possible. Without the efforts of these many unnamed individuals, The New Sand Flea Beach Club would have never come into reality. The Beach Shaggers Hall of Fame was housed at The New Sand Flea Beach Club; the Hall of Fame members grew yearly and so did the crowds who attended the induction weekends for these legends. There were some days when we thought the walls would not hold everyone. ‘Great memories’ were had by all at this location. I expect that you can ask anyone who was a member of The New Sand Flea Beach Club, and they will be able to share a special story. The New Sand Flea Beach Club lost its lease at the McAlister Square location in 1990 and was forced to search for yet another location. Once again, the owners and members worked side by side to renovate and physically move to a new location. The ‘close-down’ party was one of the better parties ever thrown at any of the previous locations; it went on until the wee hours of the morning and concluded with sawing up the dance floor. Even more amazing was that many of these people that partied so hard came back at 8:00 AM to assist in the physical move of the club. In September of 1990, The New Sand Flea Beach Club held the grand opening at its final location, South Pleasantburg Drive, Greenville, SC. The club featured what was probably the finest dance floor in the Shag community. The facility was much larger than any facility that the Sand Flea had ever occupied. The club could host large crowds with ease; therefore, it was no longer necessary to move to an outside space for functions like the World Line Dance Championship and The Beach Shaggers Hall of Fame. In hindsight, this larger and more costly space would be part of the demise of The New Sand Flea Beach Club. Competition had entered the scene in 1989 that offered the beach format on Wednesdays and Fridays without the requirement of an annual membership. The New Sand Flea Beach Club had always depended on these annual memberships to sustain the club during the lean periods of the year. But alas, as with all other good things, The New Sand Flea Beach Club had come to an end. The doors were closed on April 9, 1993. In many ways, The Sand Flea Beach club still survives in the lives of the many people whose lives were touched in some way by the club. It may have been where they learned their first basic step or maybe where they met their life partner. The Sand Flea survived for over ten years with a strictly beach format in an area far removed from any beach. This survival was directly attributed to the hard working club members over the years whose sole ambition was to support a facility in which all could share in the perpetuation of the glorious shag dance. To this end, I must say that The Sand Flea Beach Club was enormously successful. There were many Dee Jays who played their first record at The Sand Flea Beach Club and are now members of The Dee Jays Hall of Fame. There were also competitive dancers who started their dancing career at The Sand Flea. The Sand Flea Beach Club will always hold a special place in shag history and in the hearts of everyone who entered its doors.